To capture the radiant heat of the catalyst, we install a simple radiation plate above the catalyst. The radiation plate has a large fin on either end to radiate heat toward the sides of the stove. 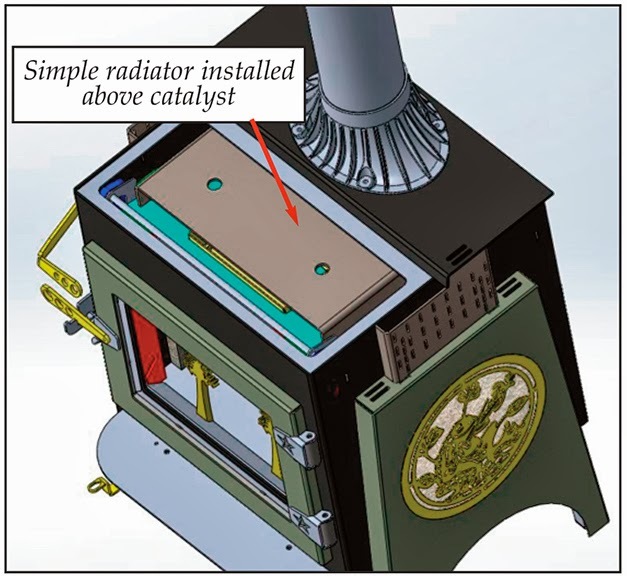 This little “radiator” above the catalyst removes heat from the exhaust stream and moves it to the sides of the stove (and it protects the steel top from excessive heat). This simple, easily removeable device is held in place with two drop-in pins. It’s just another part of the design that guarantees you more heat from less wood. We want to make sure that our owners get the use of the catalyst heat, and that it doesn’t just go up the chimney. That would be a waste!